Apart from the first half performance against Halifax, when Pools left the Shayman chasing shadows, the highlight of the day was the pre-match visit to Piece Hall, slap-bang in the middle of the town. The name itself is deceiving as it is not actually a hall. If this building was in the likes of Seville, Vienna or Florence, everyone would be raving about it. I genned up on it beforehand and so set off early. I spent an hour here and even that was not enough. 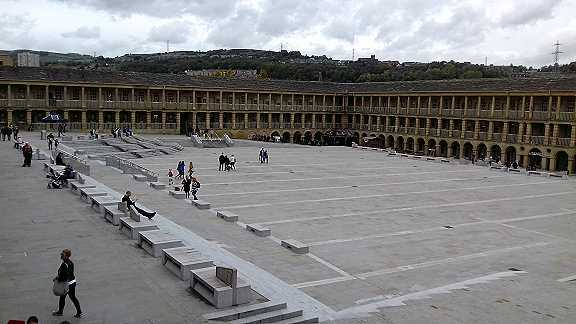 I always thought Halifax to be a bit of a dump like Middlesbrough but with bells and whistles on. In fairness I had only been here once previously for a televised (cup?) match. We had travelled down on a coach and as it was winter it was dark when we got here and dark when we left so nothing was seen of the town. Besides Piece Hall there was The Minister (which we discovered had been broken into the night before! ), Eureka Children's Museum as well as the magnificent Town Hall and Indoor Market. There are lots of old buildings made from Yorkshire stone, most still covered in soot and grime from the town's many mills, some of which are still standing. The only thing spoiling the magic of this little gem is the numerous electricity pylons on the hillsides which dominate the area. 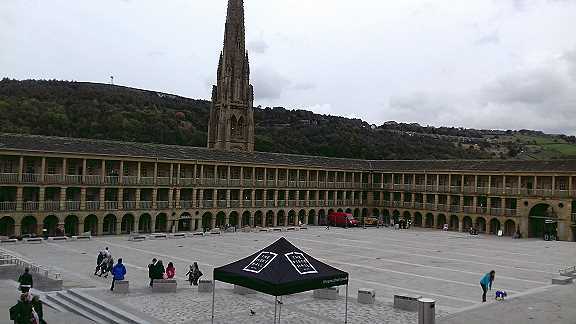 The only thing that remains of the church is the spire which is now incorporated into Piece Hall as part of the library. Now to the game - the only thing that put a damper on the match was how Pools performed against nine men. One would have thought, looking at the goal Halifax scored, that it was Pools who were two men short. Halifax is deffo worth a run out, match or no match. A few days later we were on the coach to Salford. The main topic of conversation and concern was the braking ability of the vehicle. Brakes were applied rather rapidly for some reason near Blackford's Garden Centre and the coach finally stopped a few hundred years past Sapper's Corner. Funny old place Salford. It is hard to know where Salford starts and Manchester begins, with Bury tagged on, so that means Rochdale and Oldham are somewhere very nearby. Basically they might as well rename all these towns Manchester. In fact the area is actually called Greater Manchester. I much prefer Lancashire myself. The ground has improved beyond all recognition since Pools last played there. They now have the same style of stand all the way around the ground. At best it is neat and functional but not something Prince Charles would be praising for its aesthetic beauty. Including the terracing it is totally made from steel, much like a giant Meccano set and I dare say, much like a Meccano set, it could be easily taken apart with a few spanners and moved elsewhere if required, particularly as it sits in the middle of a well to do suburban area. "One group of Poolies got in a cab and asked to be taken to the match - and ended up at Old Trafford!" I heard a great tale after the match and I do hope it is true. It was suggested that if any fans wanted a pint, the coach would drop them off at such and such a pub. Even at one and a half miles away it was the nearest drinking establishment to the ground. The plan was to have a few sherbets and grab a taxi to get to the Peninsula Stadium. It turns out that some taxis never arrived and others were late. One group of Poolies got in a cab and asked to be taken to the match - and ended up at Old Trafford! (United were at home to Derby.) I don't know who was more shocked - the Poolies or the cab driver who had to take them back to Salford. The match itself was even stevens until Salford scored - then an innings collapse. The second goal was a repeat of Halifax's. Pools offered no threat up front and I cannot remember their keeper having to make a save throughout the match as we were too busy passing side-to-side and back to Scotty Loach. Almost time wasting.